SonicDoodle is a composition tool that enables the user to turn their doodles into a traditional music score. 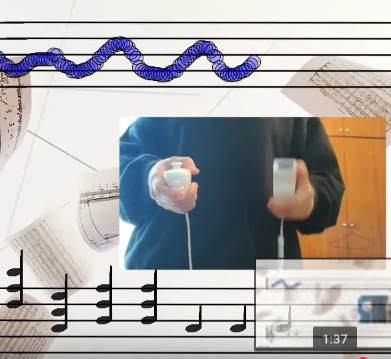 Using a WiiMote as the interface, the user draws a melody onto the projected staff. The melodic contour is translated in real-time into a sounding sheet-music. The current implementation allows insertion of melodic notes in a pre selected scale with flowing gestures that draw a doodle on the projected wall. The nunchuk analog control is used to control the amount of vibrato in the instrument and another button can be used for insertion of chords. At the end, the performance is recorded and can be imported as a midi file, ready to edited in any DAW/MuseScore etc. Team Members : Manaswi Mishra, Helena Cuesta, Manu Florencio and Tessy Troes.